Hey Kids, Sign-up for Randy’s Summer Art Camps!! 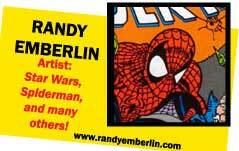 Spider-Man Artist RANDY EMBERLIN will be teaching three Cartooning and Comic Book Art Camps this July and they are open for enrollment! Join Randy this summer and have fun drawing your favorite Super Heroes! Randy’s Summer Art Camps! Three exciting weeks in July 2019! Week – 1: July 8-11 — Click to Enroll! Week – 2: July 15-18 — Click to Enroll! Week – 3: July 22-25 — Click to Enroll! You can sign up for half day or whole day classes… Click Here for more information! Class Sizes are Small and Space is Limited, so ENROLL NOW!! That’s right! When you sign up for the Summer art camps you get all sorts of Free Posters, Books, Comics and more, courtesy of our sponsor Dark Horse Comics!! [Above] Students with their free stuff courtesy of Dark Horse Comics!! Or else this guy comes to your door. Enrollment is currently underway for the Fall 2018 Term. Class sizes are limited, so don’t miss out! Randy’s after school drawing classes: Drawing, Cartooning and Animation Classes. Learn to Draw Super-heroes and Cartoon Characters with Spiderman artist Randy Emberlin. For educators in Portland and Beaverton, Randy offers several Assembly and Classroom Presentations: The Graphic Novel and the Art of Comics, The Art of Animation and Comic Books and Animation. This summer, don’t miss Randy’s Summer Art Camps. 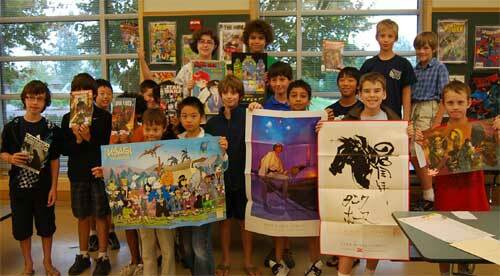 The Cartooning and Comic Book Art Camp. Come join Randy in July and have fun learning to draw your favorite Super Heroes. That’s right!! It’s Free Comic Book Day. On Free Comic Book Day, over two million comic books will be given away by participating stores, introducing as many people as possible to the wonders of comic books! Join Randy as thousands of comic book shops around the world celebrate the comic book art form!